ZIA Gallery welcomes paper-making sculptor and book artist Melissa Jay Craig and boldly expressive painter Jonathan Ricci to their opening reception Saturday, December 1, 4 – 7:30 at 548 Chestnut St. in Winnetka. Through their individual approaches, Melissa Jay Craig and Jonathan Ricci both instill a sense of whimsy in works that always offer more layers for interpretation. Melissa Jay Craig’s inventive handmade paper installations have been widely exhibited from Denmark to South Korea, Costa Rica, Mexico, South America and across the United States. Melissa is one of the artists ZIA will be taking to the much anticipated AQUA satellite exhibition of the international MiamiBasel gallery exhibitions in Miami during the first week in December. 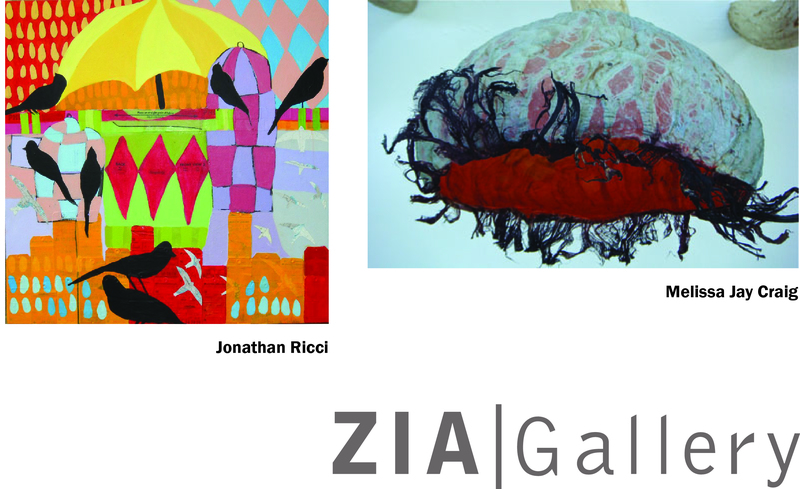 This is a prestigious event for which ZIA Gallery was accepted by jury to participate. It is a confirmation of the high level of artists represented and presented on a daily basis at ZIA Gallery in Winnetka. Jay Craig brings intellect, skillful manipulation of materials and a pointed sense of humor to unique bodies of work. Although based in Chicago, Melissa Jay Craig’s work as an artist and teacher take her to preeminent art institutions across the nation where she is universally admired and respected. Jonathan Ricci is also a celebrated educator and an exuberantly expressive artist out of New Jersey. He fearlessly combines paint, color and collage into joyfully poignant, nonlinear storytelling. His current work weaves patterns of birds with abstracted human forms into portraits both imagined and based on real individuals. Recently he was awarded a summer 2013 artist’s residency in Iceland where, no doubt, puffins will fly their way into his works. With this exhibition ZIA Gallery will be trying something new by holding the opening reception on a Saturday afternoon, December 1, 4 – 7:30. A recent one-day benefit, which occurred on a Saturday, attracted newcomers of families and passers-by. Perhaps a Saturday afternoon is a welcoming time for the extended community. The public is encouraged to come meet the artists on the 1st. Jonathan Ricci will be coming from New Jersey where he and his work survived “Sandy” while Melissa Jay Craig will be just in from a month-residency in Vermont with new work in hand. Come enjoy the thoughtful vibrancy these two artists will bring to the coming winter. The exhibition continues from December 1, 2012 – January 12, 2013. All are welcome. Contact 847-446-3970 for more information. ZIA Gallery is located 2 blocks from the Winnetka Metra Station. This entry was posted in Openings and Events and tagged art, Chicago, Jonathan Ricci, Melissa Jay Craig, painting, Winnetka, ZIA Gallery. Bookmark the permalink.